Resiliency was just one theme that played into this year's Solar Power International. Now that many manufacturers make passivated emitter rear cell (PERC) technology, the costs of transitioning to bifacial production have diminished. DNV GL is gearing up for a large study comparing bifacial and mono-facial output, with interim results expected next year. 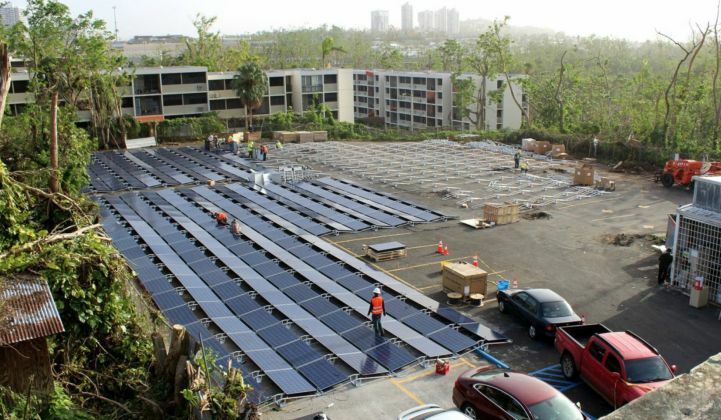 Last year’s SPI rolled into Las Vegas just a few weeks after Hurricane Harvey wreaked havoc on U.S. coastal areas like Houston and just before Hurricane Maria decimated Puerto Rico’s entire grid. In the intervening months, "resilience" evolved into a full-blown buzzword. Increasingly frequent natural disasters ensure that resilience will remain a hot topic looking ahead. And solar’s growing interest in playing nice with other tech — like storage — only reinforces the trend.